"The Black Eagles and their loved ones try to recover from the traumatic events that have beset the band, starting to piece together their lives while trying to make sense of everything that happened to them. How can they trust again, after so much betrayal? As they begin a collective healing process, they find that the future has more demons in store for them. At the centre of it all are Luke and Melissa, only just starting to put their lives back together. 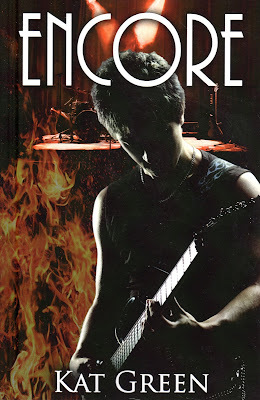 As they embark on new adventures, old enemies may not be ready to let them forget..."
‘Encore’ is the second book in the fantastic ‘Black Eagles’ series by Kat Green. This is a contemporary romance set in the world of The Black Eagles, a British rock band, following the lives of the band members, their other halves and their friends. At the end of the previous book (spoilers ahead! Continue at your own peril…) Luke Black and his girlfriend Melissa Webb are finally safe from the mentally unstable Amber, and Jay-Den Lake, the head of the Eagles record company who kidnapped Luke. All of their lives were turned upside down, Luke left with mental scars, Melissa with physical ones, Megan unable to have children and the rest of the core gang, Toby, Dale, Beth and Tom left rattled by their experiences. Dale and Beth have a child on the way, and the group are now trying to rebuild their lives. ‘Encore’ picks up a six months later. Melissa and Luke have finally won their long court battle against Jay-Den and Sky Storm Records. The band have been released from their contract, Jay-Den has been sentenced to prison, and Amber has been sectioned under the Mental Health Act. The group are now trying to move on and begin the healing process. After a while they sign with a new label, the label that also has their friends Echo, and make their first appearance back at a festival before starting to tour again. However, not long after the tour begins Amber escapes from her institution and is hell bent on destroying all their lives once more. With her newborn baby to look after, Beth is even more on edge, especially after her abusive father is released from prison and wants to come back into her life. Can Luke, Melissa and the gang escape Amber’s destructive warpath this time? This follow up to ‘Strings’ was so freaking good!! The drama is non-stop and the story flows so well that it’s almost impossible to put down. I love Kat's style of writing. It’s just so conversational and it feels like you're talking to a friend rather than reading a novel. Kat has a wonderful way of getting important information and back story to the reader without bombarding them with loads of information. One thing that I love about this series is the wonderful characters and the relationships. Luke is just the perfect boyfriend, and the way he cares for Melissa comes across so strongly in the writing. Although the characters are pretty young (a couple of years younger than myself) it’s obvious that Luke and Melissa's relationship isn't just a fling, but real, true love. Despite being a rock band, all the boys are so sweet and genuine that the relationships feel so real and wonderful. Lyla was a wonderful new character too, and proof that Jay-Den's evilness was still affecting lives even though he is now locked up. There was so much heartbreak in this book and I really hope the Eagles manage to pull through it again and become even stronger. This was a truly fantastic sequel and I'm really looking forward to book three! Hopefully they'll all get a bit of a break in the next one, although somehow I doubt it ;) This is such an amazing series Kat, and I can’t wait to read anything and everything you write next! Have you read this series? I'd love to hear your thoughts in the comments below! Kat's blog for a signed copy! "Twenty-three year old Joey Graceffa has captured the hearts of millions of teens and young adults through his playful, sweet, and inspirational YouTube presence (not to mention his sparkling eyes and perfect hair). Yet, Joey wasn't always comfortable in his skin, and in this candid memoir, he thoughtfully looks back on his journey from pain to pride, self-doubt to self-acceptance. To his fans, Joey is that best friend who always captures the brighter side of life but also isn't afraid to get real. In the pages of his first book, he opens up about his years of struggling with family hardships and troubles at school, with cruel bullying and the sting of rejection. He tells of first loves and losses, embarrassing moments and surprising discoveries, loneliness, laughter, and life-changing forks in the road, showing us the incalculable value of finally finding and following your true passion in this world. Funny, warm-hearted, and inspiring, Joey Graceffa’s story is a welcome reminder that it’s not where you begin that matters, but where you end up." 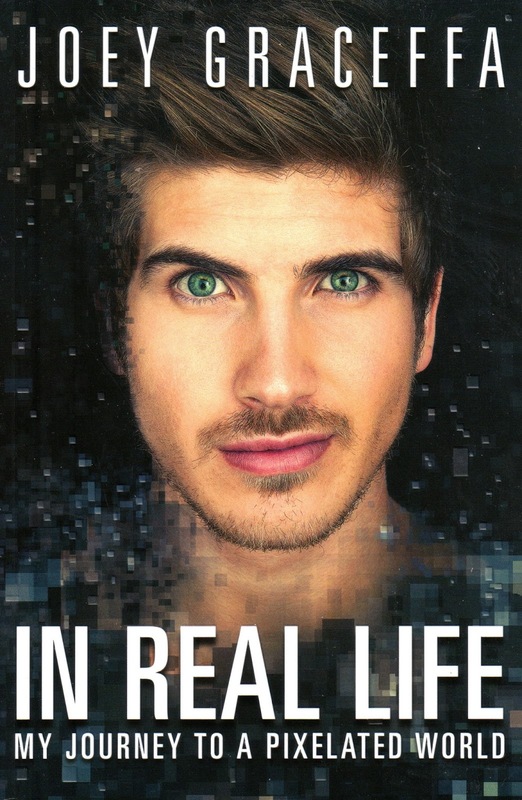 ‘In Real Life: My Journey to a Pixelated World’ is a memoir by the American YouTuber Joey Graceffa. I've been watching Joey's videos for a while now and he always seems like such a vibrant, happy person and doesn't really talk about his past. In this memoir Joey speaks very candidly about his childhood and his journey to YouTube. Joey Graceffa grew up in Massachusetts. At a young age his parents divorced and his mother didn't have much money so life was tough. Joey also suffered with learning difficulties which made school hard. He was bullied for being in the Special Education class and for his femininity. His mother was an alcoholic so home life was difficult too. Joey's main escape was his imagination. He would make up games and stories, and when he was in his teens he started recording them on video. In his mid-teens he set up a YouTube channel, WinterSpringPro, with his best friend Brittany, where they made parodies and other funny videos. In this book Joey talks very openly and in detail about what it was like for him growing up under these circumstances. I loved his honesty and this was a fantastic insight into the life of one of the most popular internet personalities. Joey also used this book to come out as gay, and I was so pleased to see how kind and supportive the YouTube community has been since his coming out. This was such a great read and I really admire Joey's courage to share his story. "Weeks after landing on Earth, the Hundred have managed to create a sense of order amidst their wild, chaotic surroundings. But their delicate balance comes crashing down with the arrival of new dropships from space. It's time for the Hundred to come together and fight for the freedom they've found on Earth, or risk losing everything - and everyone - they love." THIS REVIEW CONTAINS SPOILERS FOR THE FIRST TWO BOOKS IN THIS SERIES. 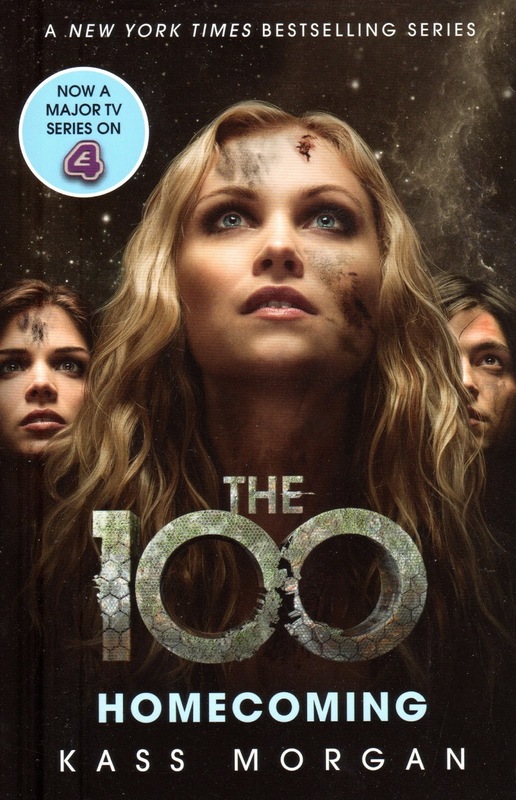 Click the links to find my reviews of 'The 100' and 'Day 21'. ‘Homecoming’ by Kass Morgan is the third book in ‘The 100’ series. This is a dystopian series set a few hundred years in the future after a nuclear war has made planet Earth uninhabitable. The last remaining humans were living on a space station called the Colony. In book one the colonists sent 100 juvenile prisoners down to the planet to see if it was habitable again. They survived, the toxic air long gone, but discovered that they were not alone. In book two the hundred meet the Earthborns. Humans who never left the ground, surviving in a bunker in Mount Weather. But not all of them are friendly. A faction of Earthborns have split from the main group and are determined to get rid of the colonists, who they think will cause trouble. Book three, ‘Homecoming’, sees the rest of the Colony (at least, the ones who make it to the limited spaces on the dropships) re-joining the hundred on the ground. The book opens with Glass sitting in the dropship in shock, having just seen her mother shot by a desperate colonist wanting her seat. She is reunited with boyfriend Luke, and the dropships are about to make the journey down to the ground. But they don’t have a smooth landing. The ships crash-land, scattered around a lake. Many lay wounded or dead, and in the landing Glass has been separated from Luke. Whilst she is frantically looking for him, the original hundred have seen the ships landing and have sent out a party, led by Wells, to help the wounded and bring the survivors back to their camp. If you've been reading my reviews for the first two of these books then you’ll know that I absolutely LOVE this series! The storyline, the character, the writing style are just all so great, and I loved that some new adult character were introduced (or at least had their parts fleshed out more) in this book. Rhodes is such a nasty piece of work and I has a good time picturing him being impaled on an Earthborn spear whenever he did something horrible. I'm really looking forward to the next book in this series, if there is going to be another? ‘Homecoming’ left me with so many more questions, namely what has happened to Clarke’s parents and how will Wells cope after his heartbreak, and I'm really looking forward to reading more about these amazing characters in this epic dystopian world. Let me know in the comments what you thought of the third instalment of this fantastic series! "Sherlock Holmes died fighting Professor Moriarty in the Reichenbach Falls. At least, that's what the press claims. However, Holmes is alive and well and taking advantage of his presumed death to travel the globe. Unfortunately, Holmes's plans are thwarted when a plague of vampirism haunts Britain. This book collects Sherlock Holmes and the Vampires of London Volumes 1 and 2, originally created by French publisher Soleil." 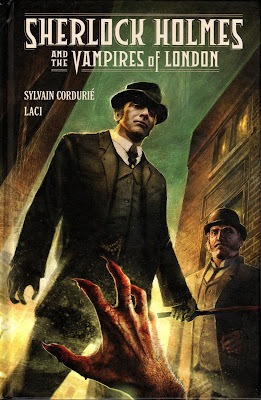 ‘Sherlock Holmes and the Vampires of London’ is a graphic novel by Sylvain Cordurie with illustrations by Laci, and published by Dark Horse Comics. It is set shortly after Sherlock Holmes supposedly fell to his death fighting Professor Moriarty at the Reichenbach Falls. The story opens with a vampire attack in London's East End in June 1891. A few weeks later Sherlock comes back to London and starts to investigate the attacks. One vampire, Selymes, blackmails Sherlock into helping him track down and kill another vampire, Owen Chanes, by threatening the lives of John and Mary Watson (who don't know that Sherlock is still alive). I can't really write too much about the storyline as, in all honesty, I didn't really get it. The above paragraph is basically what I understood, but I found this book so difficult to follow. The story was pretty complex and I didn't really feel the artwork did it justice. Half the time I was trying to figure out which character was speaking when as a lot of the characters looked quite similar. I also found the text and the style of writing quite difficult to follow. It was such a shame as I was really looking forward to reading this one. This book combines three things that I absolutely love reading; Sherlock Holmes, Vampires and Graphic Novels. I think that with a different style of artwork and a slightly less complex storyline this could have been a good read, but as it was I didn't enjoy it very much. Let me know in the comments if you've read this book, and what you thought of it!